General Motors has already detailed its plans to invest heavily into the Indian marketplace, where it envisions the company to become a global export hub, thanks to inexpensive labor. Once upon a time, South Korea was envisioned in the same light. But, now, South Korean labor costs nearly mimic North America, which has created a real problem for Stefan Jacoby, President of GM International Operations. According to The Detroit News, Jacoby said GM plants are currently running at only 60 percent of their capacities, and decisions on whether layoffs, or a shrinkage of its operations in the country, are currently being evaluated. 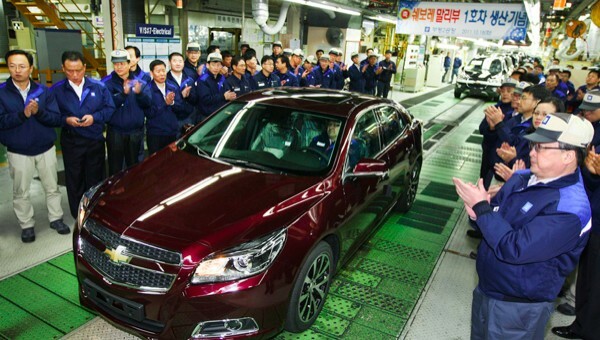 The South Korean problem stems from a previous strategic decision to pull Chevrolet out of Europe, and largely exit the Russian marketplace, once two major importers of Korean-built GM vehicles. Now, it’s “low cost hub” standing has largely been erased, and labor laws make it extremely difficult to close a plant, or reduce hourly workers. “We have not yet found the golden key on that in respect of how we solve our capacity problem in Korea,” Jacoby said, adding the overall Korean business is not profitable. GM has recently restructured its operations heavily in Australia, Thailand and Indonesia. First, GM needs to fire Jacoby. Second, Chevy has to comeback in Europe and Russia. Third, GM has to apply good strategies in every market to sell more. GM , the profit seeking manufacturer , not the revenue seeker industry . So how much does the wages paid in Korea and say North America who are about the same , impact profits ? It’s okay to take less in N. America but you need the higher profit elsewhere ? Sales can be huge in India and other third world countries but you would sacrifice this to get higher profits ? GM appears to me to be trying to emulate Cadillac with foreign produced smaller vehicles….sacrifice sales for higher profits . The bean counters reign supreme , sad really ! If they are the same they should close south Korea and export from USA!